We’ve all been there. We’ve all read the marketing blurb for a shiny new plant variety, and decided that we had to have it. We may have been good, and waited for a few days, to be sure that we really had to have it, but we’ve all paid money for brand new plant varieties for the garden. And then we find out that they don’t quite live up to the hype. You don’t hear about ‘early adopters’ outside of the tech world, really, but that’s exactly what we are, and a certain amount of disappointment is inevitable. 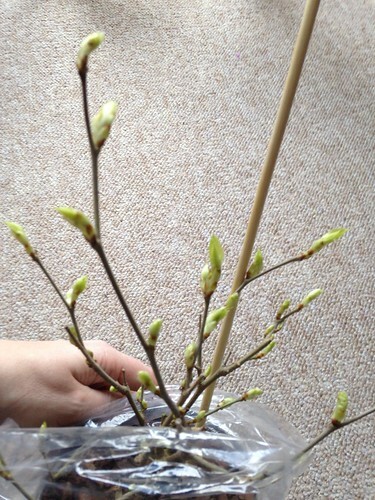 This year Suttons made a big splash about their new dwarf mulberry – Charlotte Russe. It wasn’t just that it’s a much smaller tree than traditional mulberries, and so will grow in smaller gardens, and be happy in a pot. It was also that it is a prolific fruiter, fruiting young and fruiting often, so a plant bought this spring would crop this summer. I’ve never tasted mulberries, and my existing mulberry tree is young and has yet to flower and fruit, and so I took the plunge and ordered myself a Charlotte Russe. And it arrived, and it was tiny and it was beautiful. I gave it plenty of TLC indoors, and it started to flower. The flowers are weird and wonderful things, and when the fruits started to form I was all giddy with excitement. I decided it was time to harden it off outdoors, and… disaster struck. It started to lose all its leaves and I thought it was dying. I brought it back inside for more TLC, but that didn’t help. I can see that the plant is laden with fruit clusters. Please pick them all off. If you have not potted up the plant then I would recommend to do so as soon as possible and check that there are no pests on the roots. The plant should be hardened off and put outside and watered regularly. If it is not growing away by mid June then please do contact us again. I think it is far too early to say that the plant is failing. 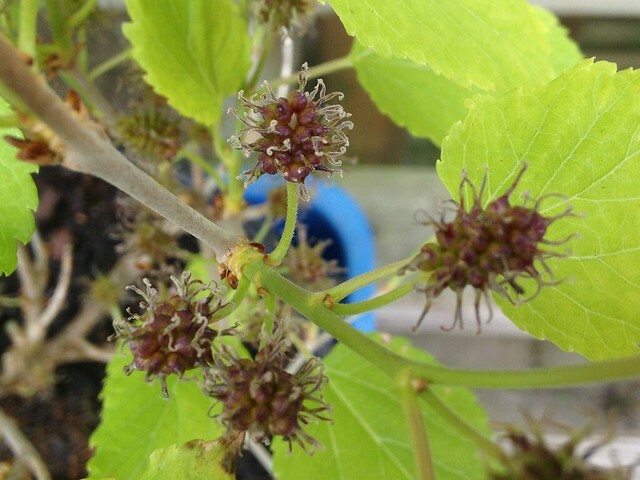 Mulberries are very robust and resilient plants, in our trials we had none failing and they were subjected to all kinds of adverse growing conditions. It was unbelievably painful to remove all of the forming fruits (not to mention sticky), but I dutifully did so. Whether or not the plant survived, my hopes of mulberries this season were well and truly dashed. And then I read about Beryl’s disappointment with her harvest, and the rose-tinted glasses well and truly fell off. In the meantime, the plant has won RHS Chelsea Plant of the Year 2017. Suttons had the exclusive to begin with, but now Wyevale are going to be selling it, too, with the terrible name ‘Mojo Berry’. It has just won a silver award for them at the New Plant Awards at the Horticultural Trades Association (HTA) National Plant Show. My plant has survived, and grown new leaves and even some more flowers. Whether they will develop into fruit is anyone’s guess, but the plant is healthy enough for the moment, and living outside in a shady spot so it has survived even the recent heatwave. I’ll have to wait until next year to give my final verdict on whether it’s a really a good option for a small garden, or if the hype is too good to be true. Suttons’ initial offering of the plant rapidly sold out, but if you want to try it for yourself, you can order now for delivery in September. Did you splurge on a Charlotte Russe? How do you feel about it now? Thanks for the link to my post Emma. 🙂 And I so agree – Mojo Berry is barrel-scrapingly awful as a name. Not least because it sets expectations about the flavour, which it’s never been judged on! My plant is starting to flower again and I am hoping that the second flush tastes better. Am still waiting for more independent flavour reviews to come out…One thing I have noticed is that, at least on my plant, the branches are very thin and have a tendency to flop over. I’m not sure they will bear the weight of fruit higher up easily – and one interaction with an interested pigeon could be its downfall!! I’ve learned my lesson. I am never, ever going to buy new shiny plant varieties again without waiting for an independent flavour review first. At least it’s a quick grower and takes well from cuttings. It’s sooooo hard to wait though! I think the Fuchsia Berry from Thompson & Morgan is another example of a plant that didn’t live up to expectations in the flavour department, although I’ve kept mine because I like fuchsias and some purple fruit is a bonus (plus they overwintered without much help from me!). If the mini mulberry can’t bear the weight of its fruit then that’s going to be a big issue, though. It’s clear that the judging of these new plants can only be done on the basis of what they look like and their perceived benefits (and is mainly a marketing gimmick). At least with the RHS AGM scheme varieties have to go through proper trials to prove their worth. I tried the fruit and was also massively unimpressed. Luckily according to the Internet, the leaves are edible and I think they taste nice. Thanks Scott. I’ll have a nibble!